Who does Andy Murray have to beat to win Wimbledon? Who will Andy Murray have to beat to become Britain's first male Wimbledon winner for generations? Many said the shock early exit of number two seed Rafael Nadal would make Murray's Wimbledon journey easier. But surely it's not THAT easy? After a rain-delayed fourth round tie left him without a proper break, it could be an uphill struggle for Murray. We take a look at who he'll have to beat if he's going to go all the way. Murray beat David Ferrer so he's back in the semis for the fourth Wimbledon running. He's now up against Jo-Wilfried Tsonga, seeded 5th. Andy has won five out of the six times they've played. 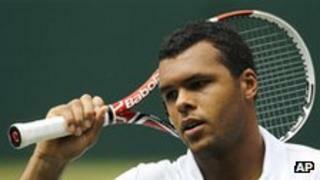 Tsonga caused ripples in Wimbledon last year when he beat six-time champion Roger Federer, so he could cause a real headache for Murray. The match will be a close call. It'll need Murray's mental strength to be rock solid. He might need to rely on the home crowd to urge him forward. It has to be Djokovic in the final, doesn't it? He's number one seed, he won last year, and he's won five Grand Slam titles across Wimbledon, the US Open and Australian Open. Not Federer? We don't think so. We reckon he'll be beaten by Djokovic in the semis. Possibly. 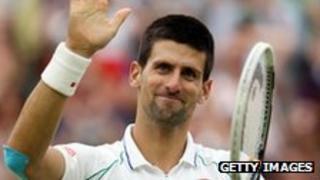 Djokovic has something of a spell over Murray in Grand Slam tournaments. In January he beat the Scot in the semi-final of the Australian Open, having finished him off in the final there the year before. More recently the two met in April this year at the Miami Masters: Murray was beaten. They met at the Boodles Wimbledon warm-up tournament: Murray beaten. But back in February, Murray beat the Serb in Dubai, and also in the Cincinnati Masters last August - so it can be done. In all, they've met 13 times, with Djokovic leading their head-to-heads 8-5. So can Murray make it this year? We'll have to watch... and wait!